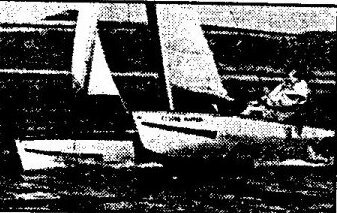 Jon Montgomery, designer of Catapult, described the background to the design, and its successful 1982 introduction---the story covers the development of British catamaran sailing, and his search for innovation to best capture the catamaran's advantages. "My father lived in Lyme Regis and had an 18ft Jolly Boat, which in its day was the fastest thing afloat. This time it was to be built in something quite revolutionary�fibreglass. We moved to Sark in the Channel Islands and designed the �Flying� series of catamarans which competed in some of the first one-of- kind catamaran trials in the late 1950�s." 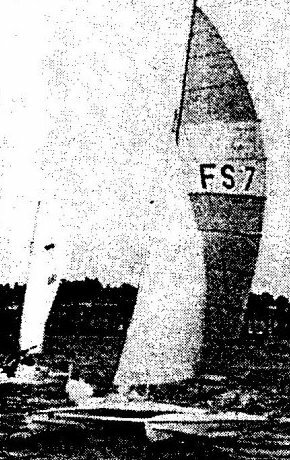 This was the first use of tortured ply construction, later widely used, including for the Tornado. 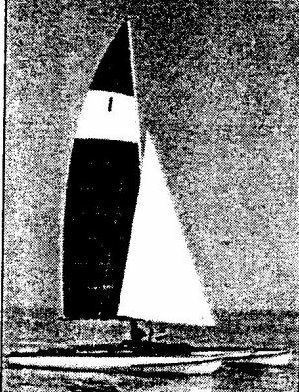 Things looked really quite promising, as we sold a number of these boats, and to improve communication we moved to Devon, Cornwall and built boats in Penryn." THE LITTLE AMERICA'S CUP: Jon Montgomery's defender bid. "In 1961, Rod MacAlpine Downie�s �Hellcat II� beat the Californian built �Wildcat� in the first Little America�s Cup in America. �Hellcat II� had to be sold to the Americans to cover expenses. The Americans immediately launched a challenge to be held in Great Britain in September 1962. 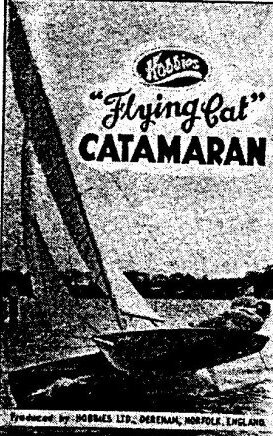 �Hellcat I� was brought out of mothballs to sail an elimination race against �Flying Rocket� and although �Flying Rocket� won that race, �Hellcat I� was selected to defend against the Americans, who were again beaten"
There was already resistance to catamarans at sailing clubs and Flying Rocket's rejection was a serious setback in promoting the �Flying� series.